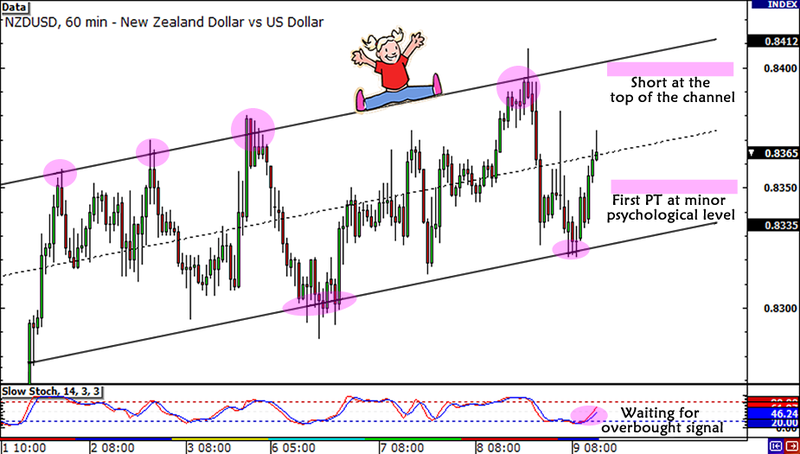 Eyes on NZD/USD: First Win of the Year! Wheeee! After a few canceled orders and one losing trade, I finally get my first winning trade of the year! Since my broker didn’t allow me to cancel my trades over the weekend, I decided to just watch my position after it got triggered on a strong rally during the early Asian session. On the 1-hour chart, I noticed that the pair was making what looks like a bearish divergence as it hit the former support area at the .8350 minor psychological level. To top it off, a spinning top (which almost looked like an evening star) formed right at that level so I decided to lock in whatever profits I had. Little did I know that the pair would still bounce higher and make it up to my profit target at .8370! I know I could’ve exercised some patience in waiting for price to hit my target, but I chose the safe route and I don’t regret it one bit! 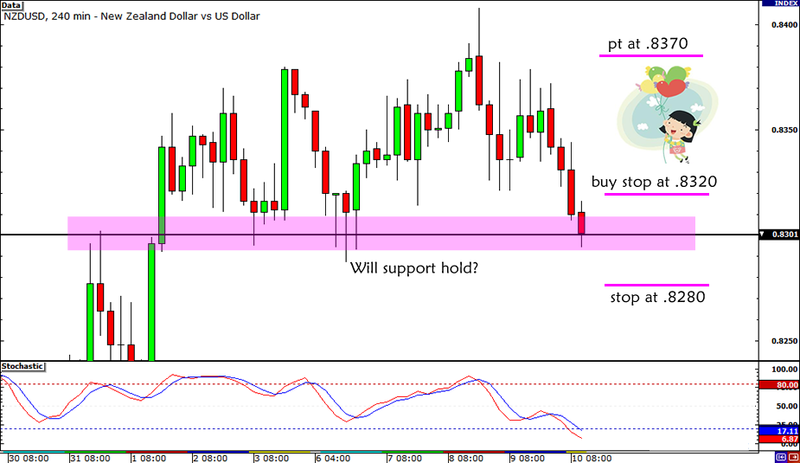 But before I go, do you have any comdoll trade setups that you think I should keep my eye on for this week? Hit me up! Have a love-filled Valentines Day to you all! 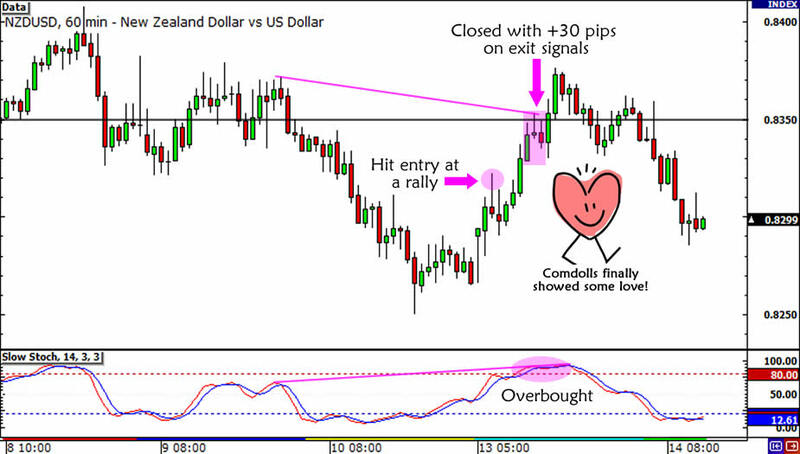 Thanks to Mattspips’ comment below, I took a closer look at NZD/USD and spotted a more promising setup. As we can see, the .8300 had been a pretty good resistance area in late January. Then, the major psychological level turned into a support area for most of February. I’m crossing my fingers that the level will continue to hold in the next couple of days. Since the pair had already broken the rising trendline that I spotted yesterday, I’m now turning my focus on a potential bounce from the .8300 handle. Fundamentally, I’m relying on the strong Chinese trade numbers we saw a couple of hours ago, as well as the recent positive developments in the euro region to hold up risk appetite. Place buy stop order at .8320 (above the current 4-hour candle), tight stop loss at .8280 (below Feb 6 candle low) and take profit at .8370 (PWH and yesterday’s high). Since it’s in my trading resolutions to not have a position open over the weekends, I’m planning to cancel my order if it still doesn’t get triggered before the end of the week. If it gets triggered and I’m ahead by a few pips, I will move my stop to break even over the weekend. What do you think? Do the Kiwi bulls still have enough muscle, or are we already seeing a reversal? Again, I can’t tell you how much I appreciate your advice! Is the Kiwi rally overdone? By the looks of its daily chart, it sure seems so! I decided to zoom in to the 1-hour chart to look for a potential entry level, but it appears that NZD/USD‘s uptrend is still very much intact. I’m seeing a resistance level around .8400, which is also close to the top of the channel! As for fundamentals, New Zealand‘s jobs report came in mixed as it printed a weaker than expected increase in employment for the last quarter of 2011 but showed a 0.3% drop in joblessness. The U.S. doesn’t seem to be doing so well as it got a debt rating downgrade warning from S&P. If they don’t get their finances in order anytime soon, I have a feeling that risk aversion will pop its head back in the markets and force the comdolls to return their recent gains. While my bias is a bit bearish, I still haven’t decided on an actual entry level yet. I think it’d be better for me to wait for more confirmation, such as reversal candlesticks on the .8400 area, before jumping in. I’ll keep you posted through any of the following accounts so make sure we’re connected!